Florida Keys snook range in size from 3 - 40 pounds. Smart and incredibly feisty, they're also mild and flavorful, and are one of the tastiest Florida fish you'll ever catch. It's interesting that Florida snook never used to be a popular eating fish. When commercially harvested they were used for canned cat food. This is because the flesh of the fish had a soapy, unpleasant residual taste. Once it was determined that the odd flavor was due to the skin being left on the cleaned fillets, the commercial and recreational value of the fish rose dramatically. Now fishing for snook is one of the more popular Florida Keys activities. Challenging and fun, novices and seasoned saltwater fishermen enjoy the ability to target these hard hitting Florida fish. From Key Largo to Key West, the best fishing guides can take you out to the numerous islands dotting the backcountry where the snook hide out among the mangrove roots. With their boats, they can stealthily sneak up to the best fishing areas so you can catch your fill of these tasty, fighting fish. Want To Go Snook Fishing? Unfortunately, the commercial and recreational harvesting of this Florida fish has severely declined as a result of two particularly bad, and rare freezes. The 2001 - 2002 freeze was particularly devastating to the fish in the area. 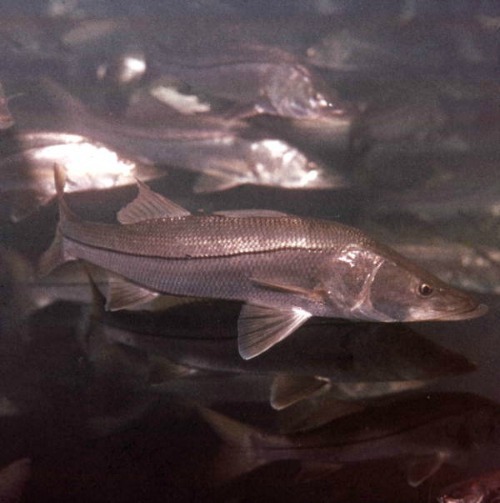 Florida Keys snook were just making a comeback when another bad freeze occurred in 2010. The effect of these 2 cold snaps took their toll. Even though many different species of Florida fish were affected, the Florida Keys snook were especially hard hit. Snook are not able to easily survive water temperatures below 60 degrees. In September, 2011, due to heavy Florida Keys snook losses, the FWC Commissioners voted to protect this Florida fish. In the backcountry and Everglades only catch and release was allowed. In June, 2013, the Commissioners voted to reopen recreational snook fishing in the Gulf of Mexico effective September 1, 2013. In the Atlantic with the deeper, warmer water, Florida snook fared better. Restrictions allow 1 catch per person, per day with the fish measuring between 28" - 32" from nose to fork. Separate permits were required and Florida sport fishing enthusiasts could only use hook and line or fly. To keep up to date on Florida Keys fishing regulations affecting snook this link to Florida Fish and Wildlife Conservation Commission will provide you with the necessary guidelines. Snook are often referred to as linesiders and can occasionally be spotted in freshwater. Snook usually they live near reefs, bridges, mangroves, and along the shoreline in brackish water - any place where there's cover. Fly fishing Florida Keys backcountry waters is one of the more exciting ways to target Florida Keys snook. The Everglades National Park is a real haven for these sneaky opponents and is one of the more popular places to sight and fly fish for them. Key West snook fishing is also good especially in the grassy flats. You can go out for the day, or you can also plan on Key West night fishing trips. Night fishing has proven to be particularly productive for catching linesiders, as this is when they primarily feed. You can also go offshore of Key West, FL out to the many mangrove islands. One area in particular, the Great White Heron National Wildlife Refuge has hundreds of small mangrove ringed islands which are perfect ambush spots when snook fishing in Florida. 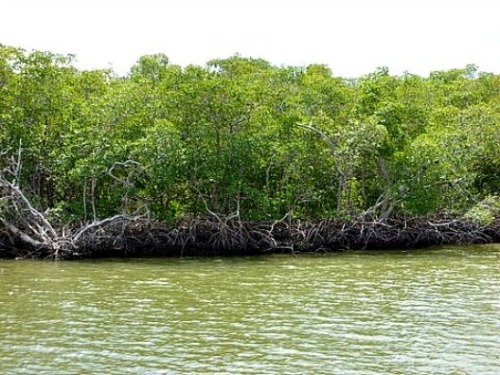 The common denominators you'll want to look for will be shallow waters, and multiple structures ranging from grass cover to mangrove root systems. This is where your quarry hides and where you'll have the most success. When fly fishing Florida Keys, once you've isolated your target area, your next job will be to exercise dedicated patience as you work to coax and entice this Florida fish into taking your fly. Snook are a challenging fish to catch. They're often compared to bass for their preference for cover, and for their fast strike action. Even though they're hiding in or near the various structures, that doesn't mean you're going to have any success catching one. They can be difficult to spot as they will typically lie motionless in their hiding spot, waiting to strike passing prey. Snook are also incredibly smart and wary, plus they spook easily. As an angler, you have to be ultra-savvy when approaching and presenting your cast to a linesider. A side benefit of the FWC restrictions resulted in linesiders getting larger. Hooking a bigger snook on light weight tackle is exactly the thrill a Florida sport fishing enthusiast looks for. Once you entice it to strike, they'll hit hard and fast like a bass. Big fighters, snook will race and leap into the air and do everything they can to get back into cover. At this point, your primary goal is to prevent this from happening. If they get back into the mangrove root structures or other cover, you're going to have a hard time getting them out. They'll tie up your line in the roots, and you'll end up snapping it or they'll gill your leader first. Fishing for Florida Keys snook is one of the most exciting adventures a Florida sport fisherman can look forward to. Make sure you plan on including linesiders in your list of 'most fun to catch' next time you go Florida Keys fishing.